“Soil is not a heritage from our parents, but a bequest to our children.” This was the adage given to buttress the need to always educate the younger generations on the importance of protecting the soil. The piece of advice was given by Professor Oluwatoyin Babalola, an expert in Soil Microbiology in the Department of Soil Science and Land Management, College of Plant Science and Crop Production (COLPLANT) of the University. Professor Babalola had described the soil as a non-renewable resource while calling for the importance of always cherishing and protecting it. According to her “We need to tell our children the need to protect our soils and learn to use it well, so that it will serve us well and we will hand it over to the future generations in good condition.” As a means of protecting soil fertility, she discouraged the removal of the soil organic surface layer, through the use of bulldozers and other heavy machineries, compaction of soil surface through overgrazing and application of ammonium fertilizers which tend to acidify the soil. Rather, she encouraged the adoption of soil management practices that will lead to aggregation of the soil. She urged farmers to leave the residues of their farm products on the farm-land, in order to return all organic matter back to the soil and also to carry out cover cropping, to protect the soil from erosion during the off-season. Professor Babalola made reference to her Ph.D Thesis titled, “The Effects of Micro-organisms on Rock Phosphate Solubulization in Soybeans and Maize Production in the Northern Guinea Savannah”, saying that her research was aimed at examining effect of micro-organisms that are inhabiting the soil on rock phosphate, which informed that about 50 per cent of the indigenous soil micro-organisms and were able to solubulize the rock phosphate to varying levels. She added that when such rock phosphate is applied to soil along with the inoculation of these microorganisms at the root of the plant, the effect would be comparable to what is obtainable when you add the regular fertilizer. She further stressed that the rock phosphate is rock material that is used predominantly as fertilizer raw material, because it has high amount of phosphorus and for most crops, phosphate is needed and applied as Nitrogen Phosphorous Potassium (NPK) or Single Super Phosphate (SSP), which is required by plants to grow. According to her, “the Sokoto rock phosphate is in the form of regular rock, while its deposit in Ososun, Ogun State, occurs in the form of small stones. In fact, a company is currently processing it as raw material for the production of fertilizers. Because most crops have high need of Nitrogen and Phosphorus, we are looking at applying it directly and engaging the normal biological interactions in the soil and make it available to the soil”, she added. Professor Babalola, whose experience involved working with farmers in the Northern part of the country and the Institute of Agriculture, Ahmadu Bello University, Zaria, spanning over a decade, stated that gone were the days when farmlands in the north were believed to be unproductive, as farmers in the region now make good use of fertilizers and harvest in large quantities, which explains why most food stuffs are produced in that region. 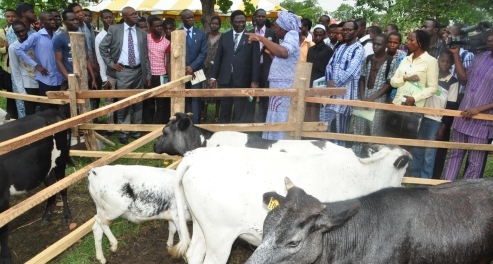 She said that farming in the north was safer in most cases, as they do not experience some of the attending challenges the southern farmers were facing, such as pests attacking the farmland and thieves stealing farm produce, aside the fact that the northerners seemed to be more committed to farming. On the effects of researches in the country, the Don aligned herself with belief that researches in the country were not making the necessary impact as required, while ascribing the cause to communication gap between researchers and policy makers. She also noted that research findings were not often made available to farmers and policy makers, advising that Nigerian universities should gain relevance by being able to solve local problems. Professor Babalola added that she loves to impact on younger scholars (especially females) and always seizes every available opportunity to encourage the culture of research in her students by being persistent, focused and diligent, in order to excel.